This project was really fun because we got to write our own recipes, and record cooking videos to show our understanding of the content in Spanish class this year. I am so excited to show my work, because I am not very good at editing videos, and I think this one came out better than expected. I wanted to create Spanish Rice because my friend always creates the most delicious dishes and it is always a huge part of them. It was surprisingly inexpensive, and easy to make, as well as delicious. I found this project fun, and challenging and didn't run into very many road blocks. This project was my favorite spanish project of the year, because I love Frida Kahlo, and she is iconic to the development and progression of women in the art world. I connect heavily to the struggles she experienced in her life and the way they reflected in all of her artwork. We first read a biography about Frida, and learned about the events in her life, and her relationships that eventually lead to her success. We then watched a movie based around her experiences, and I felt so exited to feel so heavily connected to a Spanish idol. We then wrote our own biography about a person of choice, and I chose Salvador Dali. He is such an amazing person to me because I went to see his artwork in florida, and I just love his work on such a deep level. That's why I thought I could relate him to Frida Kahlo. This went very smoothly for me, and I followed the basic structure of a biography, and it came out pretty good. 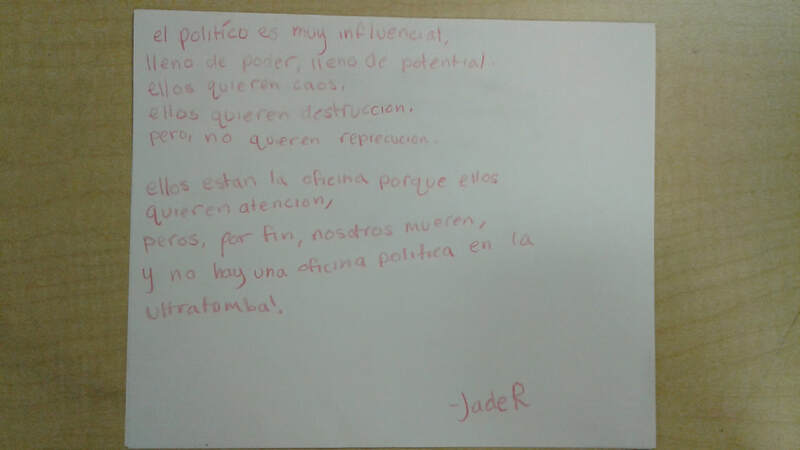 I am proud that I was able to write something comprehensible and easily followable in Spanish. Then, we started working on portraits of our special person, and I chose to base mine around the Frida painting "Thinking About Death", because it is very beautiful and relatable. I worked really hard on this piece, and it ended up being painted over by a miscommunication which was a bummer. I think it made me feel upset because it was not a throw away project, so in the long run i'm glad I got to create it in the first place. In this project, we made poems making fun of the lives of humans, because in the end no matter how powerful or beautiful or rich you are, we all die. I decided to write my poem about the lives of politicians, and make my art piece about the effect of political news on a normal person. It shows a girl who is dead surrounded by demons, and lies. I think that I could have made my poem a lot prettier, and more put together. But I did spend a lot of time editing and composing this piece. 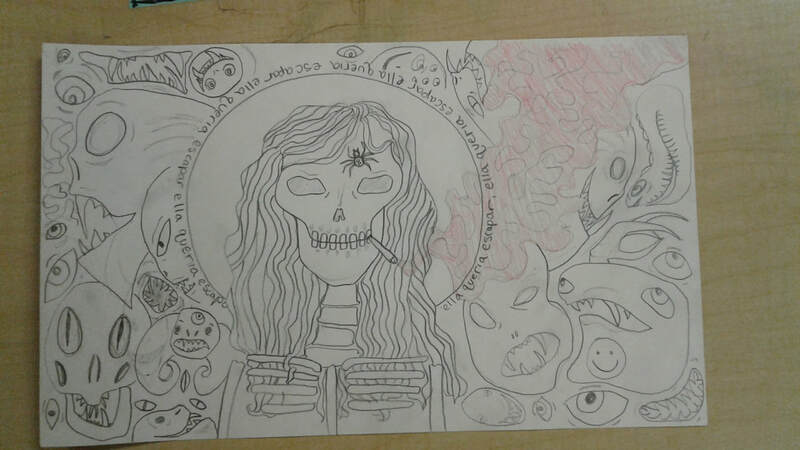 I also spent a lot of time drawing my art piece. I love the way the art piece turned out because I really think it captures what I was trying to go for, but the poem is sloppily written out on orange paper. In all I really enjoyed this project.